Definition at line 743 of file cacls.c. 758 // FIXME: Convert to proper parsing, with support for /? Definition at line 363 of file cacls.c. Referenced by ChangeACLsOfFilesInCurDir(), and GetPathOfFile(). Definition at line 589 of file cacls.c. Definition at line 644 of file cacls.c. Definition at line 551 of file cacls.c. 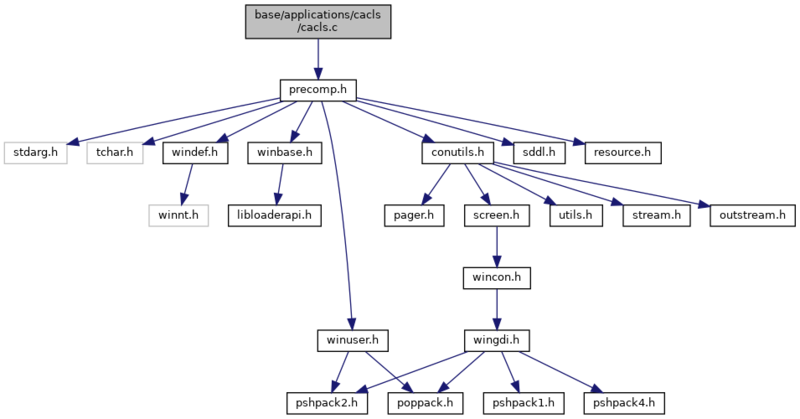 Referenced by ChangeACLsOfFiles(), and ChangeACLsOfFilesInCurDir(). Definition at line 537 of file cacls.c. Definition at line 511 of file cacls.c. Definition at line 372 of file cacls.c. Referenced by ChangeACLsOfFiles(), and PrintDaclsOfFiles(). Definition at line 465 of file cacls.c. Definition at line 405 of file cacls.c. Definition at line 37 of file cacls.c. Referenced by _tmain(), ChangeACLsOfFiles(), ChangeACLsOfFilesInCurDir(), GetPathOfFile(), and PrintDaclsOfFiles(). Definition at line 47 of file cacls.c. Definition at line 485 of file cacls.c. Definition at line 544 of file cacls.c. Definition at line 25 of file cacls.c. Referenced by _tmain(), and ChangeFileACL(). Definition at line 27 of file cacls.c. Definition at line 23 of file cacls.c. Referenced by _tmain(), ChangeACLsOfFiles(), ChangeACLsOfFilesInCurDir(), and PrintDaclsOfFiles(). Definition at line 24 of file cacls.c.